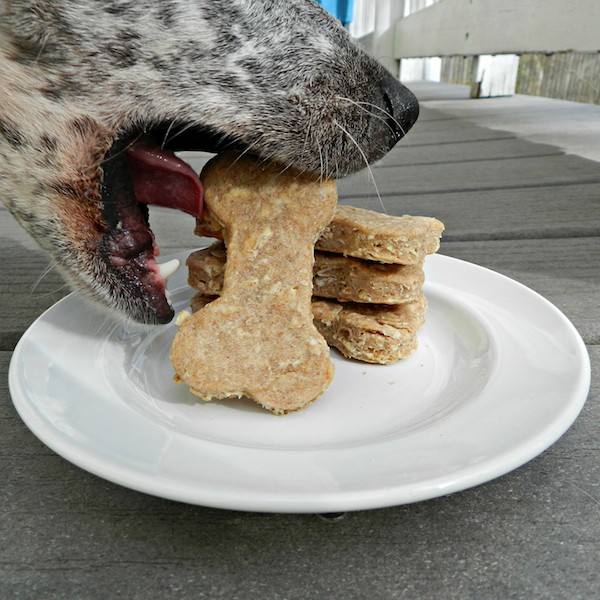 This weekend I wanted to do something special for my pups, so I decided to make some homemade peanut butter and oatmeal dog treats! This recipe is great because most, if not all, of the ingredients I usually already have in the pantry. 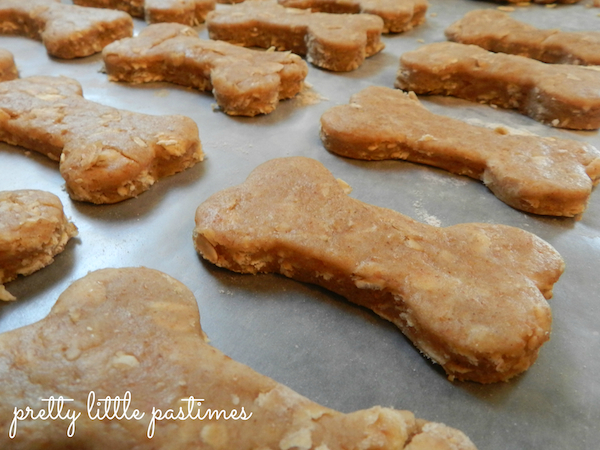 They are quick and easy to make and my dogs just love gobbling them up as soon as they are cool! Preheat your oven to 350 degrees. In a mixing bowl, whisk together the peanut butter, honey, olive oil and chicken broth. In a separate bowl, combine the flours, oats and cinnamon. Slowly mix the dry ingredients into the peanut butter mixture until combined. If your dough is too dry add more chicken broth one tablespoon at a time. Transfer the dough to a flour dusted surface and roll the dough to about 3/8″ thick. 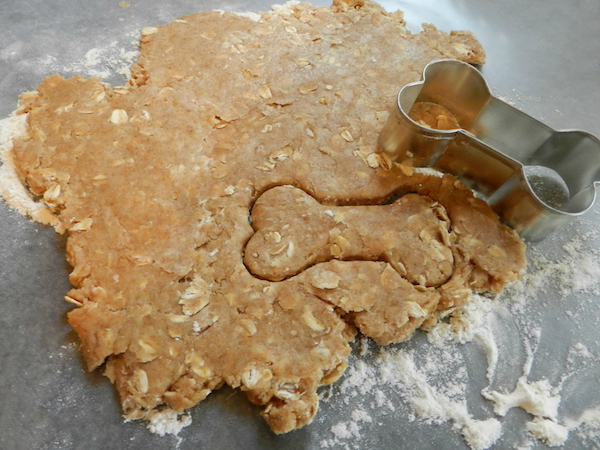 Use a cookie cutter (I used a bone shaped one) and cut out your treats. Combine the scraps and keep rolling to get as many treats as you can out of the dough; I ended up with 26. Place the unbaked treats onto a parchment lined cookie sheet and bake for 13-15 minutes. Remove from the oven and transfer to a wire rack to cool completely. 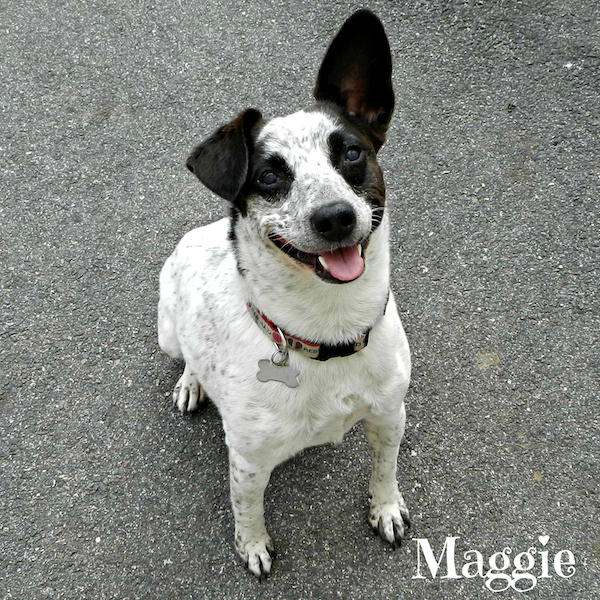 I took a plate of these outside to get some shots when they were all baked, but a certain puppy of mine, Miss Maggie May, had other ideas! By the look of this happy little face looking up at me, I’d say she liked them!